Instagram has been one of the top social media sites since 2010, and continues to connect people worldwide through creative images. Instagram has been a way for businesses to advertise their products and services to reach out to potential customers. Last May, Instagram launched a new business feature that will provide information to companies like never before. If your company hasn’t switched to the business feature already, now is the time to gain insights on your posts, stories, and followers. 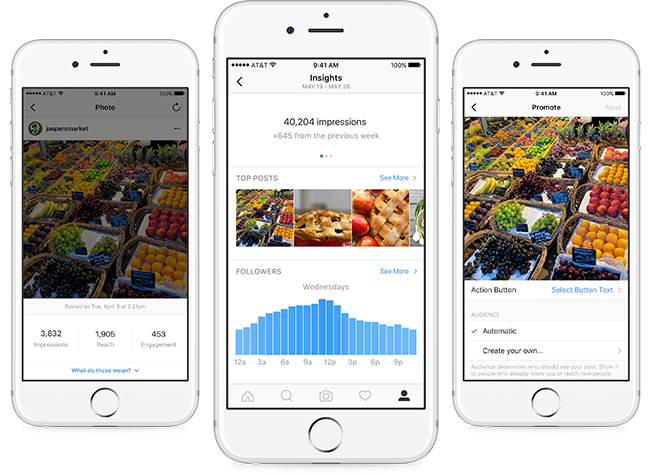 Over 8 million businesses use the Instagram Business Feature. Why Switch to the Business Feature? The business feature on Instagram is an important way to gain and share information about your business to your followers. You can add business information such as business hours, location, phone number, and type of business. Customers also have an easy way of getting ahold of your business by taking advantage of the Contact button. The Follow Insights feature is my personal favorite. The Insights button lets businesses see how many total impressions their images and stories made in one week. It also allows businesses to see the average time their posts reach a majority of their followers. Insights gives you access to demograpics of followers ranging from gender, age, and location. This feature is really beneficial for businesses because they are able to create more relevant content based off of their audience. Posting professional relevant pictures will push awarness to your business, app, product, or service. Check out how many people you could be reaching with your Instagram business posts. -Go to your profile and tap the settings button. -Tap Switch to Business Profile. -On the Connect Your Facebook Page screen, you’ll see all of the Facebook Pages you’re currently an admin on. Select the Page you’d like to associate with your Business Profile on Instagram. -On the “Set Up Your Business” Profile page, review your business’s contact information, make any changes and tap Done. For more information, Instagram has free online training sessions to help you grow your business with their business feature.